The state Department of Transportation wants to install more video surveillance cameras next year to improve security at various train stations from Darien to Westport, and it will hold a public hearing to get your views on Oct. 17 in Norwalk. The Connecticut Department of Transportation will be conducting a public information meeting for State Project No. 0300-0202 concerning the Network Infrastructure Upgrades Project. Department of Transportation personnel will be available during the meeting to discuss the project. The meeting will be held on Wednesday, Oct. 17, 2018, at 7 p.m. in the Norwalk City Hall Community Room, Room 128, located at Norwalk City Hall, 125 East Ave., Norwalk. The public information meeting is being held to afford a full opportunity for public participation and to allow open discussion of any views and comments the community may have concerning this proposed project. Any persons interested in this project are welcome to attend this meeting and discuss the project with Department of Transportation personnel. 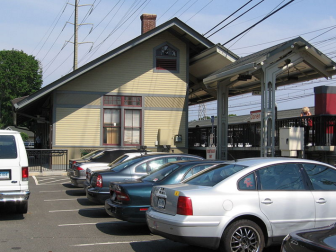 Due to the security improvements and network infrastructure upgrades, the Department of Transportation has determined the need for installing security cameras at the Noroton Heights and Darien railroad station platforms in the Town of Darien; Rowayton, South Norwalk, and East Norwalk railroad station platforms in the City of Norwalk; and Westport and Greens Farms railroad station platforms in the Town of Westport. The Department of Transportation has also determined the need for installing security cameras at the railroad bridge over the Saugatuck River (Saga Bridge) in the Town of Westport. The project schedule indicated that construction is expected to start in fall of 2019, assuming acceptance of the project, availability of funding and coordination with the Town of Darien, City of Norwalk, and Town of Westport. Plans for the project will be posted on the Department of Transportation’s and the Town of Darien’s websites for review prior to the meeting. Plans also will be on display for public review starting at 6:30 p.m. for the informal session. Anyone interested in requesting information on this project should contact Mr. Yure Kuljis, Project Manager, at telephone number (860) 594-2895. You may send written inquiries to Mr. Jayantha Mather, Transportation Principal Engineer, Department of Transportation, 2800 Berlin Turnpike, P.O. Box 317546, Newington, Connecticut 06131-7546. Please refer to State Project No. 0300-0202 in all correspondence. The meeting facility is ADA accessible. Language assistance may be requested by contacting the Department’s Language Assistance Call Line at (860) 594-2109. Requests should be made at least five business days prior to the meeting. 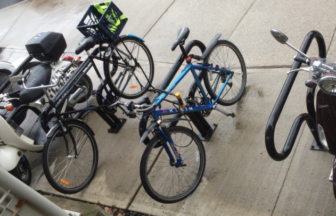 Bicycles at Darien Railroad Station (shown here) and at the Noroton Heights station have been stolen on a regular basis. Sometimes in the past, car parts and even cars themselves have been stolen. Existing surveillance cameras have provided limited coverage, and their value has been limited, police reports have shown. Persons having a hearing and/or speech disability may dial 711 for Telecommunications Relay Service (TRS) and instruct the operator to contact (860) 594-2243. Language assistance is provided at no cost to the public, and efforts will be made to respond to timely requests for assistance. Editor’s note: The state’s announcement was passed on by the Darien Department of Public Works to local news organizations. Darienite.com has rearranged paragraphs, added subheadings and made minor edits. From 11:35 a.m. to 11:52 p.m., a thief removed two bicycles, both locked, from each of Darien's two train stations, according to surveillance video records, police said. In those 17 minutes, the man stole property valued at a total of $1,400 by the separate owners. The project to replace all the concrete platforms at Noroton Heights Railroad Station is officially not due to be over until June 2019, according to the state Department of Transportation, but Darien Public Works Director Edward Gentile doesn't believe it. He thinks commuters will be more likely to be using the new platform by this coming Christmas.